There are currently several aftermarket OEC screen upgrades: a single, large split screen, two individual screens, fixed screens, rotating screens, screens on an articulating arm. There are also 1k, 2k and now whispers of 4k resolution. With so many options, choosing the right monitor upgrade is a nuanced decision that depends on several factors. For most facilities, the cost of upgrading is a compelling factor in determining which upgrade to choose. Among the upgrades available now there is still quite a broad price range. We're currently seeing prices from $6,000 to $11,000. The higher end of that spectrum is likely to include features like articulating boom arms (in the style of the OEC 9900) and 2k resolution monitors. Not all 9800 monitor upgrades are created equal. It's important to do some leg work and look at brightness, contrast, and resolution for a start. The differences in quality can be vast. Keep in mind that the native camera of the 9800 provides a 1k x 1k resolution. The monitor market has outpaced this technology. You may see monitors advertised as capable of 2k x 2k or even 4k resolution, but pairing monitors at that resolution with regular 9800 cameras may not always be a good thing. To truly improve image quality, you're going after optimization of the existing image. Think of the first time you upgraded your TV and watched standard definition cable through your new expensive Samsung 1080P flatscreen- not ideal. The principal is the same here. Until the resolution of the image itself has increased, it's possible you may be introducing noise or flaws into your image with a far higher-res monitor. It's worth noting that increased image resolution from the source may not be too far away. 9800 detector upgrades pending FDA and 510k approval now claim to increase image signal to 4k. When that signal resolution becomes available, the full benefit of those hi-res monitors can be enjoyed. A warranty on upgraded monitors themselves is one thing. A warranty on the C-arm itself is quite another. The major drawback of using any third-party monitor upgrade is that once you install them on your 9800, you are no longer eligible for GE/OEC service. GE considers these upgraded systems to be out of compliance, which will leave you solely reliant on third-party service. Fortunately, there is an option for facilities that would like to both upgrade and use OEC service. Some approved vendors, Block Imaging among them, offer a monitor upgrade developed and approved by OEC that allows the system to remain compliant and under the OEC umbrella of service coverage. 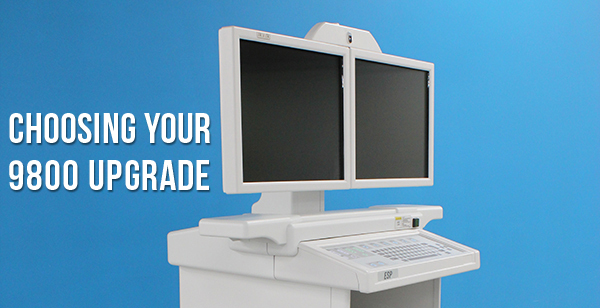 Upgrading the display capabilities of your OEC 9800 is not a one-size-fits-all proposition. 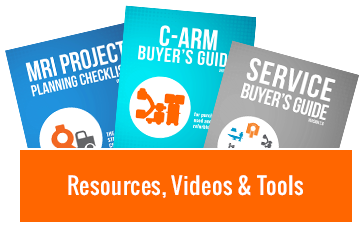 Your budget, your goals and preferences for warranty/service coverage, and even the possibilities presented by upgrades for other parts of the C-arm all factor into which upgrade will be the best fit for you. Regardless of which OEC 9800 monitor upgrade you choose, our team is ready to help you increase the performance and extend the life of your 9800. Use the button below to get in touch and let us know how we can help.